Providing all the performance on the straights and on the bends. A true rapid-setting adhesive, BAL Rapid-Flex One offers superior qualities for the end-user including fast grouting capabilities, extended open time and working time allowing for larger mixes reducing the costs for the end-user. Incorporating BAL’s Fibre Strand Technology, BAL Rapid-Flex One offers outstanding flexibility and performance making it suitable for most wall or floor substrates. One bag and one colour for any application. Standard setting and highly flexible, BAL Max-Flex Fibre has been developed with our Fibre Strand Technology for improved flexibility and strength. With and extended open time of more than 40 minutes and a pot life of five hours, BAL Max-Flex Fibre is suitable for use fixing most tile types (including some natural stone), BAL Max-Flex Fibre is recommended for large format wall tiles, areas of total immersion, heated screeds and plywood walls. Also suitable for installations subject to limited movement and vibration and for tiling on existing glazed ceramic tiles. Formulated with lightweight rheology, BAL Max-Flex Fibre offers outstanding benefits to the end-user, whether contractors, fixer or homeowner, helping them get the job done easily and efficiently. Easy to mix and spread, it’s extended open time allows for a greater area to be fixed in one mix. Available in white and grey, BAL Max-Flex Fibre comes in pack sized of 20kg and 5kg (20kg only in Grey). For use on walls and floors, it can be grouted in 16 hours. Developed over more than 50 years, BAL CTF4 is a standard-setting, polymer-modified cementitious tile adhesives for walls and floors. Offering extended open time of 30 minutes, and pot life of five hours, BAL CTF4 is suitable for fixing ceramics, porcelain and vitrified tiles, mosaics, certain natural stones, terrazzo, rigid foam insulating materials and brick slips in dry or wet interior and exterior environments. Recommended for large format wall tiles and showers, BAL CTF4 is highly water and frost resistant. 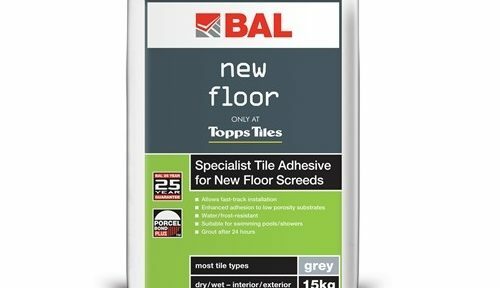 Formulated over many years with a trusted heritage, BAL CTF4 is polymer-modified producing improved characteristics including reduced slip and extended open-time allowing for larger installations to be be tiled in one mix . Suitable for bed thickness from 2mm to 6mm, BAL CTF4 can be grouted after 16 hours. Available in white, BAL CTF4 is suitable for most backgrounds and substrates, except floors subject to lateral movement or vibration. BAL CTF4 is particularly recommended for projects with large format wall tiles and showers. Standard setting and highly flexible, BAL Max Flex Fibre has been developed with our Fibre Strand Technology for improved flexibility and strength. With and extended open time of more than 40 minutes and a pot life of five hours, BAL Max Flex Fibre is suitable for use fixing most tile types (except natural stone). BAL Max Flex Fibre is recommended for large format wall tiles, areas of total immersion, heated screeds and plywood walls. Also suitable for installations subject to limited movement and vibration and for tiling on existing glazed ceramic tiles. Formulated with lightweight rheology, BAL Max-Flex Fibre offers outstanding benefits helping you or your fixer get the job done easily and efficiently. Easy to mix and spread, it’s extended open time allows for a greater area to be fixed in one mix. Available in white and grey, BAL Max-Flex Fibre comes in pack sized of 20kg, 10kg and 5kg (20kg only in Grey). For use on walls and floors, it can be grouted in 16 hours. BAL Supercover Rapid Flex provides outstanding benefits for the end-user, including a high yield for further coverage per bag, rapid-setting in only three hours for quick installations, and highly flexible nature for with difficult backgrounds which may be subject to total immersion, lateral movement or vibration. Typical coverage on a dry wall and mosaic trowel is 1m² per kg, meaning you get more for your money and get the job done in double-quick time. Standard setting and highly flexible, BAL Max Flex Fibre have been developed with our Fibre Strand Technology for improved flexibility and strength. With and extended open time of more than 40 minutes and a pot life of five hours, BAL Max Flex Fibre is suitable for use fixing most tile types (including some natural stone), BAL Max Flex Fibre is recommended for large format wall tiles, areas of total immersion, heated screeds and plywood walls. Also suitable for installations subject to limited movement and vibration and for tiling on existing glazed ceramic tiles. Recommended for fixing mosaics. BAL Max-Flex Fibre offers fixers outstanding benefits helping them get the job done easily and efficiently. BAL Max-Flex fibre is formulated with lightweight rheology for easy mixing and application and its extended open time allows for a greater area to be fixed in one mix. Available in white and grey, BAL Max-Flex Fibre comes in pack sized of 20kg and 5kg (20kg only in Grey). For use on walls and floors, it can be grouted in 16 hours. Developed over more than 50 years, BAL CTF4 is a standard-setting, polymer-modified cementitious tile adhesive for walls and floors. Offering extended open time of 30 minutes, and pot life of five hours, BAL CTF4 is suitable for fixing ceramics, porcelain andvitrified tiles, mosaics, certain natural stones, terrazzo, rigid foam insulating materials and brick slips in dry or wet interior and exterior environments. Recommended for large format wall tiles and showers, BAL CTF4 is highly water and frost resistant. Formulated over many years with a trusted heritage, BAL CTF4 is polymer-modified producing improved characteristics for your fixer. Suitable for bed thickness from 2mm to 6mm, BAL CTF4 can be grouted after 16 hours. Available in white, BAL CTF4 is suitable for most backgrounds, except floors subject to lateral movement or vibration such as underfloor heating or timber. Enhanced with BAL Fibre Strand Technology (FST) for improved flexibility and strength, BAL Rapidset Flexible Fibre can be grouted after only three hours, and provides extended open time of 30 minutes and working time of 60 minutes. For use on interior or exterior floors and walls to fix most tiles types, most natural stone, terrazzo, rigid foam insulating materials and brick slips, BAL Rapidset Flexible Fibre has a smoother consistency for easier mixing and application. BAL Turbo Set allows fast track completion of projects with the ability to grout tiles after just 30 minutes. With a working time of 15 minutes, conditions dependent,BAL Turbo Set is ideal to finish your last 1-2m² of tiling to a allow for same day grouting or to fast-track minor repairs. BAL Turbo Set is flexible and suitable for most backgrounds, areas of total immersion, heated screeds and installations subject to limited movement or vibration. An ultra-rapid setting adhesive, BAL Turbo Set is perfect to complete projects in super-quick time. Turbo Set is extremely versatile and can be used for the quick completion of jobs when fixing ceramics, porcelain and vitrified tiles, mosiacs, mosttypes of natural stone (excluding translucent), terrazzo and granite, rigid foam materials and even brick slips. BAL Turbo Set is perfect for dry or wet interior and exterior environments. BAL Supercover Rapid Flex is perfect for large walls and floor tiling projects where high yield and quick drying capabilities are required. As well as setting in only three hours, it is highly flexible, meaning it is perfect for use on difficult backgrounds which may be subject to total immersion (such as swimming pools), lateral movement (such as heated screeds) or vibration. Typical coverage on a dry wall and mosaic trowel is 1m² per kg, meaning you get more for your money and get the job done in double-quick time. Homeowners should consider BAL Supercover Rapidset for large projects which require completion in double-quick time. Providing a high yield and quick drying capabilities, BAL Supercover Rapidset is suitable for walls and floors and can be applied to most backgrounds or bases included heated screeds, areas of total immersion and limited movement/vibration when modified with BAL ADMIX AD1 and/or used with BAL RAPID MAT. What’s more BAL Supercover Rapidset is suitable for most tile types, except natural stone susceptible to water staining. BAL Rapidset is a long-standing and trusted wall and floor adhesive with rapid-setting and reduced slip properties. Setting in only two hours, BAL Rapidset features a pot life of 30-45 minutes and is suitable for fixing ceramics, porcelain and vitrified tiles, mosaics, certain natural stones, terrazzo, rigid foam insulating materials and brick slips in dry or wet interior and exterior environments. Available in grey and white, BAL Rapidset is highly water and frost resistant. BAL Rapidset offers fixers a number of benefits to help them get the job done in time and on budget. Most notably BAL Rapidset has an ultra-quick setting time, meaning tiles can be grouted in only two hours reducing costs for the customer and allowing more jobs to be completed each week. BAL Rapidset is suitable for commercial and domestic projects but not areas of total immersion, heated screeds or limited movement/vibration unless modified with BAL ADMIX AD1 for extra flexibility. Looking for your project to be completed in ultra-quick time? Then make sure you’re using BAL Rapidset as the adhesive of choice for your wall or floor tiling. Thanks to its formulation, BAL Rapidset can be grouted in only two hours, reducing your labour and material costs substantially. BAL Rapidset is suitable for most domestic or commercial projects but not areas of total immersion, heated screeds or limited movement/vibration unless modified with BAL ADMIX AD1 for extra flexibility. Standard setting but highly flexible, Max Flex Fibre have been developed with our Fibre Strand Technology for improved flexibility and strength. With and extended open time of more than 40 minutes and a pot life of five hours, Max Flex Fibre is suitable for use fixing most tile types (including some natural stone), Max Flex Fibre is recommended for large format wall tiles, mosaics, areas of total immersion, heated screeds and plywood walls. Also suitable for installations subject to limited movement and vibration and for tiling on existing glazed ceramic tiles. Consider specifying Max-Flex Fibre for wall and floor tiling projects where flexibility and super-strength adhesion is crucial, such as large format wall tiles, swimming pools, showers, installations with limited movement, heated screeds and plywood walls. Available in grey and white, Max-Flex Fibre is perfect for commercial and domestic projects and is suitable for fixing ceramics, porcelain and vitrified tiles, mosaics, certain natural stones, terrazzo, rigid foam insulating materials and brick slips in exterior or interior projects. Standard setting and highly flexible, BAL Max Flex Fibre has been developed with our Fibre Strand Technology for improved flexibility and strength. With and extended open time of more than 40 minutes and a pot life of five hours, BAL Max Flex Fibre is suitable for use fixing most tile types (including some natural stone). BAL Max Flex Fibre is recommended for large format wall tiles, fixing mosaics, areas of total immersion, heated screeds and plywood walls. Also suitable for installations subject to limited movement and vibration and for tiling on existing glazed ceramic tiles. BAL Single Part Flexible should be specified on M40 and M20 Specs for wall and floor tiling projects on difficult background where an extended working time is required. Available in white and grey, BAL Single Part Flexible is suitable for ceramics, porcelain and vitrified tiles, mosaics, certain natural stones, terrazzo, rigid foam insulating materials and brick slips in dry or wet interior and exterior environments. Please not some types of natural stone may be susceptible to water staining. BAL Single Part Flexible offers contractors numerous benefits over standard cement-based wall and floor tile adhesives. Highly-polymer modified, BAL Single Part Flexible is highly flexible and has reduced slip, making it suitable for difficult backgrounds and installations subject to movement or vibration. Available in white and grey, BAL Single Part Flexible offers increased open time and extended pot life allowing larger installations to be tiled in one mix, producing project savings. BAL CTF4 is suitable to be specified as a standard-setting wall and floor adhesive for internal and external projects with solid and stable backgrounds which are not subject to limited movement or vibration. CTF4 is particularly recommended for projects with large format wall tiles and showers, making it suitable for commercial and domestic projects. Please note CTF4 is not suitable for areas of total immersion or tiling onto existing glazed tiles, plywood walls, metal, painted, glass/metal tiles. Available in white. BAL Turbo Set allows fast track completion of projects with the ability to grout tiles after just 30 minutes. With a working time of 15 minutes, conditions dependent, BAL Turbo Set is ideal to finish your last 1-2m² of tiling to a allow for same day grouting or to fast-track minor repairs. Available in white and grey, BAL Turbo Set is flexible and suitable for most backgrounds, areas of total immersion, heated screeds and installations subject to limited movement or vibration. A unique flexible cementitious adhesives for walls and floors, BAL Turbo Set offers the contractor ultra-setting qualities superior to other rapid-setting tile adhesives. Use BALTurbo Set to finish projects in super-quick time, allowing other trades on-site sooner. BAL Turbo Set can be used for fixing ceramics, porcelain and vitrified tiles, mosiacs, most types of natural stone (excluding translucent), terrazzo and granite, rigid foam materials and even brick slips. BAL Turbo Set is perfect for dry or wet interior and exterior environments. Specify BAL Supercover Rapid Flex on your M40 or M20 Specification for large commercial installations with time and budgetary constraints. BAL Supercover Rapid Flex offers outstanding yield at 1m2 per kg at 1mm bed thickness. BAL Supercover Rapid Flex can be grouted in only 3 hours, allowing tiling projects to be completed in hours rather than days. Highly-polymer modified, BAL Supercover Rapid Flex is highly flexible meaning it is suitable for heated screeds, swimming pools and difficult background subject to movement. Consider specifying BAL Supercover Rapidset for large commercial projects where a high yield and rapid-setting qualities are important. Suitable for walls and floors, BAL Supercover Rapidset can be applied to most backgrounds or bases included heated screeds, areas of total immersion and limited movement/vibration when modified with BAL ADMIX AD1 and/or used with BAL RAPID MAT. What’s more BAL Supercover Rapidset is suitable for most tile types, except natural stone susceptible to water staining. BAL Rapidset offers specifiers a number of benefits, particularly for projects which require fast-track installations such as overnight refurbs. Suitable for most tile types, except certain types of natural stone susceptible to staining, BAL Rapidset can be specified for most backgrounds except those subject to limited movement, full immersion or heated screeds. BAL Rapidset is suitable for wall and floor tiles, and internal or external, wet or dry environments.